When Blizzard first announced the Battle.net and Real ID feature I'll admit I didn't quite 'get' it. I never fully understood what purpose it could serve not being a Starcraft or Diablo player. My Real ID friends, for serious. From Vanilla wow though until mid Wrath of the Lich King I had never even created an alt on any server other than my main server. "Why would people need to talk to people on other servers?" I wondered. I had never known any of my friends or raid team to play on multiple servers. I didn't realize that it was a thing that people did! Once the system was implemented I of course used it although I've always been a bit weary of who I give my information to (as I use a completely separate e-mail address for my Wow accoun). There haven't been many people in game whom I felt the need to share my Real ID with. If I needed to speak with someone I could simply wait until they came online, on an alt that I knew. I can understand it being an incredibly useful tool for a guild or raid leader. The friends I have on there at the moment are either real life friends or friends I have played with or raided with for a long time. 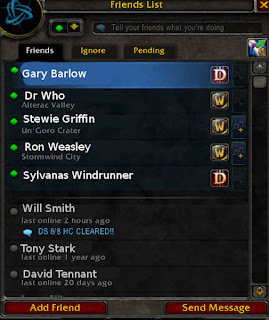 With the release of Diablo 3 Blizzard has come up with a new way for people to connect within their games which allows players to add each other to their Battle.net friends lists using a username rather than their Battle.net e-mail address. While the Battle.net Battle Tags aren't currently in effect within World of warcraft it is something they are hoping to achieve in time. I decided on Friday that I'd had enough of leveling my Shaman (currently 83) and that it would be a good idea to accumulate some rested experience so I switched over to my level 80 Warrior for a change of pace. I had leveled my Warrior earlier on in the year with recruit a friend. I'd gotten her to level 40, then granted her levels up until 80. She's been sitting abandoned ever since. When I logged into her she was wearing a wonderful selection of level 20-30 greens in the very few slots she had actually filled. What's green and yellow and looks like a buffoon? Having just completed the Mount Hyjal quests for the 7th time with my Shaman I opted for leveling though dungeon finder instead of questing. I figured the best way to do that would be to spec Protection! I grabbed a spec, glyphs, bought a whole Hardened Obsidium set from the AH (crafted by Blacksmiths), set up some key bindings and off I went! The first two instances were a little shaky since I haven't Warrior tanked in such a long time. Setting up key bindings two minutes before entering an instance may also have been a silly idea but you live and learn! I started to feel more confident after having done Blackrock Caverns three or four times when I bumped into a really awesome group of people. It was the first instance I'd done that night with a group of really good DPS (damage dealers) who seemed to actually know what they were doing. The Shaman healer was fantastic! Once the run had ended we did a couple more instances together and I had a great time. When we decided to call it a night I gave the Shaman my Battle.tag (unbeknownst to me that they had not actually been implemented into Wow yet) and went downstairs for a few minutes. When I got back to my desk I had several messages from a level 1. It was the Shaman healer! He stated how fun it had been to have played with me and asked me to add him to battle.net. Since he gave up his e-mail address first I felt slightly less hesitant about adding him. Since then we've done lots of dungeons together. Although we don't tend to talk much when not in an instance he's a great healer and I feel really confident having him around. We keep a fast pace through the instance, we're both helpful and patient if anyone asks a question or has to nip away for a minute. Once we both reach level 85 maybe we won't play together anymore, maybe we'll even remove each other but for the moment I'm having fun with my new friend. He's the first person I've added to my Real ID friends list who I hadn't previously known and now that I play on a different server from most of my friends I have a better understanding of why so many people like the Real ID function! I would honestly prefer to just give a battletag out, it seems like a much easier system, not having to give away personal info. Yeah, I can imagine having officers and such on Real ID must be amazing for a guild leader even if you just have to get a hold of someone quickly, say someone else has backed out of a raid etc. I'm excited about battletags. The e-mail address I use for my wow has my name in it, which completely puts me off giving it to anyone I don't know! 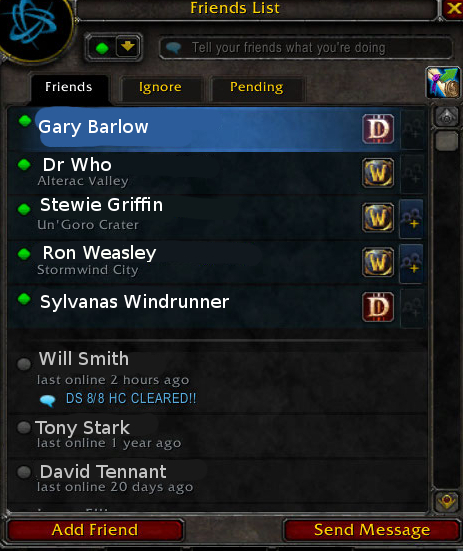 I've only added 1 stranger so far, the rest are mainly twitter friends or guildies. My stranger was a guy looking for help with the Halaa mounts thing - I wanted those mounts too so we spent a pleasant Saturday morning killing each other repeatedly :D We still say hello occasionally even after my 3 month break. With the battletag thing - hmm, maybe, hadn't really thought about it to be honest. Oh god, those mounts! I did those a while ago with two guilds over vent. Yeah, with the battle.tag thing I think I'd be more willing to add random people from twitter or with the new cross realm zones they're talking about it might be nice to add someone who you stumble upon in Burning Steps or something. You could always change the e-mail address you have tied to your battle.net. I did a few months ago because I kept getting phishing e-mails and such constantly. So I changed it to an e-mail I use solely for wow. You could use your farli g-mail account or something, then you're not really giving anything away other than your name of course. I'm looking forward to battle.tags coming out, I'll be much more likely to use those!